And What a great way to recycle a piece of American Automotive History! 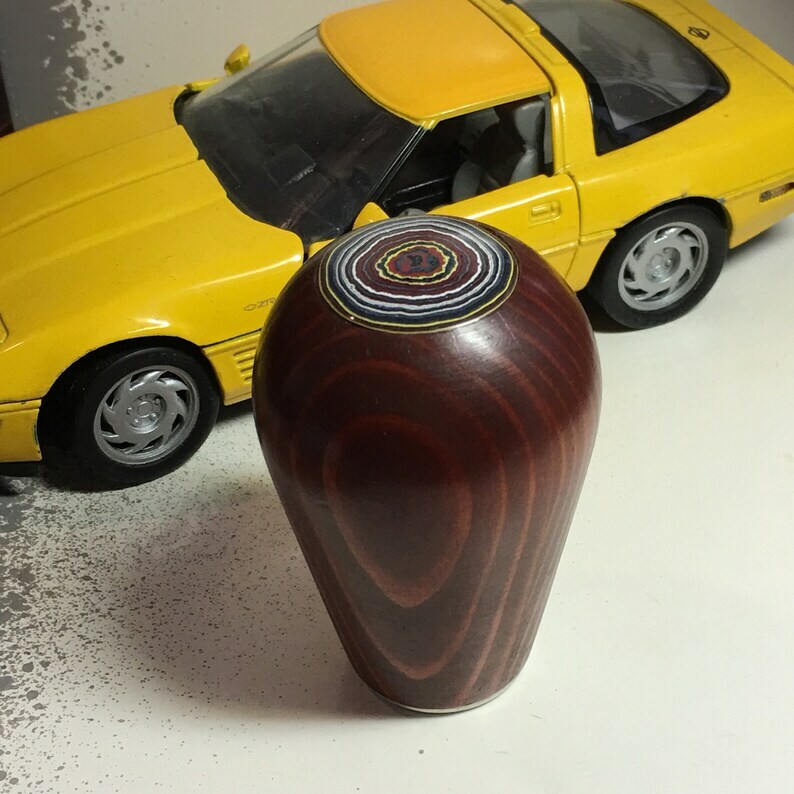 This Wooden Car Shifter Knob at a Swap meet and Drilled the center to hold this Corvette Paint insert. Very cool metalic colors to this Corvette paint from the Bowling Green Plant. I personally Hand cut the Oversprayed Car paint, so each piece is One of a Kind. This piece turned out really Cool and does not have to be used as a Shifter...would make a great paper weigh. I purchased the paint rough from a Gentleman that I met at the Carlisle Corvette show last year....he actually worked in the Bowling Green Plant and took home some of this "industrial waste" and made knife handles & letter openers out of it...we got together and I purchased a box lot of rough. A Great Holiday present for the Car Enthusiast in your family!! from the,1970s and before, automotive production lines. Shipped and arrived at lightening speed! Beautiful piece of artwork. Very unique. Didn't even know this kind of thing existed until I stumbled on it here. These cufflinks are amazing, really beautiful the way they are cut, polished and mounted. They look 100 times better in real life than they do in the picture (and they look pretty good in the picture) - they have a lot of depth and character, and some of the layers were metallic paint so they sparkle when the light hits them. Really beautiful creation. Pamela was very helpful with the purchase as well. Great experience. Absolutely gorgeous! Very fast shipping! Paypal is the preferred method of payment. Paypal is the credit card processor for all Etsy orders. You do NOT need to have a Paypal account to use the system to pay with an echeck or credit card. If for some reson, you are uncomfortable with using Paypal. I am willing to accept personal checks and money orders. Please understand that I will not ship your items until that payment has cleared, which can take up to a few weeks from the time the check or money order is deposited. We do offer Layaway on items over $200 - with 25% down and 25% per month for the next 3 months. I try my best to give accurate descriptions of my items and photos. If for any reason you are not satisfied with your purchase, please send me a an email at ppearls54@gmail.com and I will do my best to correct the situation. Please send a mail within 5 days after receiving your purchase, if you are not happy with you piece. All items must be returned in new and unused condition with the original gift box. Refunds will be issued less shipping charges and Pay Pal fees. It is strongly recommended that returns are sent back with insurance. No refunds will be made on items lost in the mail. ***Custom Orders are NOT refundable. All orders are shipped within 1-2 business day, with the exception of custom requests. All orders are shipped thru USPS, Flat rate, Priority with a 2-3 days day estimated delivery schedule. Should you need your purchase quicker, please let me know and I can upgrade shipping to Next Day and I can also ship with FedEx, if that is your choice. Be assured that Items will be packed with the utmost care for safe arrival and will be gift boxed ready to be presented to your love one. I have shipping prices set at a rate which will include tracking. This will ensure that your package arrives to your home safely. I cannot be responsible for items lost in the mail. Insurance is recommended, but optional and NOT INCLUDED IN THE SHIPPING COST. If you would like to have your item insured that will be an addition charge and I do suggest that for items over $200.00. If you choose not to insure your package, it is at your own risk. Orders will ship to the address listed on your Paypal account. It is your responsibility to ensure the correct address is listed. No refund will be offered in the event that an incorrect address was supplied.